In my search for eliminating toxins and chemicals out of our food, home, and bath products I found something that works better than any store-bought moisturizer I have ever tried. I was hesitant to try at first; I was leery of the texture it would leave on my skin and afraid it would make my skin breakout. The verdict? I will never go back to the moisturizers I tried before! What do I use now? I use organic extra virgin coconut oil. I use it on my face and body – and while I cook. You can even add it to your shampoo or use it as a hair mask. It goes on like oil but it doesn’t leave an oily or greasy feeling on your skin (unlike some lotions and facial moisturizers). 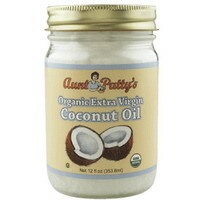 The coconut oil pictured above – Aunt Patty’s, also has a very light coconut scent which I find quite pleasant. My skin has lovely glow, I don’t breakout, and I no longer have some dry spots. This is my favorite moisturizer. Better yet, it doesn’t have any harmful chemicals! A jar costs about $8-12 – very comparable to any moisturizer you will find in the stores.